Back in the 1950s, as a lawyer and a judge, Haitham Maleh began promoting human rights in Syria. Haitham Maleh was arrested after an interview with opposition TV. In the 1980s he was detained without trial for seven years. 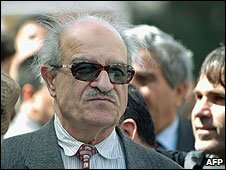 Since then he has been tried three times by military tribunals and only last year, now in his late 70s, Haitham Maleh was arrested again. The BBC’s William Edmundson spoke to his son, Ilyas. 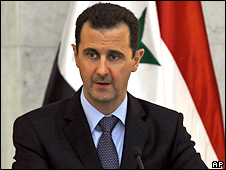 Bashar al-Assad became president after his father died in June 2000. It is nearly 10 years since Bashar al-Assad inherited the Syrian presidency from his father, Hafez al-Assad. So what are the prospects for change in the country? Joshua Landis heads the Centre for Middle East Studies at the University of Oklahoma. Freedom is God given right, it has been taken away from us by our leaders,this is a disease of society,it is always accompanied by corruption,it will keep the majority of people poor.we can not depend on foreign power to change things from dictatorship to freedom,the people must have right to possess arms,armed society will not tolerate dictators. Freedom can never be earned by begging or diplomacy,it is earned by blood,it is power against power. “the people must have right to possess arms,armed society will not tolerate dictators.”?? Are you out of your mind? How could you think of such terrorizing idea? Putting arms in public hands? Did you think about the consequences of such horrible idea before you wrote it? It’s extremely disturbing to know that someone like you who lives in the west and well educated to even write something so outrageous and ugly like that. Hold your cows. it is proven that where a society are able to own weapons will have no dictatorship, we in the USA are allowed to own guns,the dictators are so strong because they have police who threaten the people,they can not criticise the dictator,the disparity between the power of the dictator and the power of the people is so wide,we dare not open our mouth. There should be a balance between the goverment power and the people power,the goverment job is to facilitate transactions among its citizens,but never to control freedom and spread fear, and terrorize the citizen. Yes there will be bloodshed initially,but later there will be democracy,and rule of law. Hoe can Syria learn from the US on making up districts to represent the people , who is responsible for redistricting in the US and can that be done in Syria , what about having 2 senators from each Syrian county to protect the interest of small counties . I have not been on this post as I was very busy for some time now but I noticed that someone has posted as observer as well. May I suggest that we each choose a number and mine from now on will be Observer53. As for political change it will be very difficult as I see now the emergence of more than one modernity in the world. By modernity I mean the move on the part of a society from a mind set directed principally towards the past with very little thought about change for the future to one where the future is paramount and the actions of the present are dedicated to this future. The modernity paradigm that dominated the world was that of the West as it moved into the industrial revolution, the development of the nation state, the building of institution of governance, the honing of military skills and eventually to colonialism and the dominance of the world. Now this is receding and receding fast. The idea that any modernity has to follow the Western example is now obsolete as we see a different modernity in China, India, Japan of course being the first to go that route. In this new format, a central authoritarian regime with close control and direction of the economy while maintaining a political limited sphere. This model fits nicely with the family structure of Chinese culture and of Eastern cultures in general and this is very attractive to the authoritarian regimes of the regions. The disaster in Iraq has allowed them to show any opening as an Iragi alternative and the people have agreed to acquiesce. The regimes are also convinced that China will show the way of improving the economy without allowing of political freedoms. Therefore, I see no prospect for any significant change in the region. The problem is that these pygmy states do not have the unity and the size and the potential and the educated masses that China has to take off. I am afraid that only demagogues of the religious zealots will have the discourse open and those that are harking for a Western style freedom of expression or even a separation of powers are discredited by the association with Imperialist West. Combined with the long standing tradition of shifting blame and refusing to take responsibility, I see no prospect for change. OBSERVER53’s damning statement is somewhat of a double edged sword. If read “one way” it confirms a theory espoused by two economic theoreticians who were awarded the 2005 Nobel Economics Prize. A Robert J. Aumann and Thomas C. Schelling for their work on “Game Theory”. application of the principle of “forceful cooperation” due to the “fear of punishment”. This is in effect a practice many contend is employed in the treatment given to the Palestinians. Mr. Aumann, who defends “Greater Israel”, upon a Jewish racial foundation, opposes the creation of a Palestinian state”. A modicum of fairness by OBSERVER53 in reference to “the pigmy states” would have to admit that not all “pigmies” are equal. And they give Nobel Prize for developing theoretical foundation for operational racism and oppression (The real name of forceful cooperation). Go figure. My understanding is that torture is part of forceful cooperation. I am sure Professor Aumann had a nice living lab full of Palestinians to test his theories. You know, sometimes I hate being a scientist. The disaster in Iraq has allowed them to show any opening as an Iragi alternative and the people have agreed to acquiesce. But we should not be quick to make conclusion, Iraq had two things1) Occupation by foreign power(christians backed by zionists)which was hurting the dignity of Muslem Iraqi. 2) Elimination of long standing doctatorship. The occupation caused the sudden disbanding of the army all the sudden over 500000 man lost their jobs and labled as Baathist,enemy of people. this is bound to create violent reaction,as those people turned to collection of raw bands,in the absence of people goverment,during shock period. This violent reaction will not happen in other arabic countries,if there is no occupation. But then why quibble when the NP is given to a world leaader that mentions the word “peace” and “change” a number of times while his armies are killing men, women and children on a daily basis. Sometimes we all need to hate being considered equal human beings to the likes of the Aumanns and friends. Thank you for the answer. Agree. I have been thinking of the issue of power co opting scientists. Take for example the struggle within the American Psychological Association (Psychologists, not Psychiatrists). Some of its members were full participants in torture proceedings and in designing interrogation techniques, which are based on experimental studies many of which are rooted in game theory and in in studies conducted by Israeli psychologists (in small jails and in the bigger jail called west bank). The Psychiatrists (those with medical degree), on the other hand, adhered to the standards of the AMA, which prohibits participation and had no need for discussion. In other word, Norman’s colleagues were the more ethical of the two groups. What does that mean Majed? What “Christians” are you talking about? and why you used ‘Christians’ and then you used “Zionists” not “Jews”?? Be consistent when you want to write, besides, you’ve been long enough on this site to know that many if not all of us doesn’t appreciate any hint of sectarianism on here and we don’t appreciate any call for using arms to solve domestic issues, check the Iraqi’s militias and see how bad using arms is on a democratic system. I’m curious to know after reading what you write on SC, why do you live in a “Christian” country if you think that Christians are similar to Zionists? You have weird ideas and weird comments that doesnt make any sense whatsoever. I do not think Majed was trying to incite sectarianism here. I think he was referring to GWB branch of Christian Zionism, which we all know is similar to Islamic fundamentalism with respect to their view of the clash of civilizations. There is no doubt in my mind that GWB was to a large extent motivated by his screwed-up view of Christianity. Likudnicks find it very easy to ally themselves with shady characters such as John Hagee, who views Israel not as a homeland for Jewish people, as many early Zionists did, but as a vehicle to fulfilling a biblical prophecy, which leads to the complete annihilation of non-converted Jews. Some Jewish thinkers were appalled at AIPAC for inviting John Hagee to one of their power-display conferences. Presenting Islam as the enemy of civilization has been the job of many neo-cons islamophobes and few evangelical leaders who believe in the dual covenant theory. Poeple like Daniel Pipes, a striking example of Islamophobia (or better yet, phobias in general) have no problem befriending John Hagee, who on several occasions declared holly war (crusade) against Islam. I believe that this is the type of christians-backed-by-zionists Majed was referring to, not all Christians. I have seen several interviews with american soldiers in Iraq and with their families here in the US. One common theme that even trumpeted american exceptionalism, was the conviction that these soldiers were doing God’s work. It is not Majed’s problem that GWB wanted it to be Christian-Muslim war, it is Bin Laden, GWB and the neocons with their likudnick agenda who wanted it so. Unfortunately, reading commentaries on both Arab and Western blogs shows that they have succeeded in doing so, especially within fundamentalist circles on both sides. I know that your blood boils, as does mine, when you here such non-sense. You know very well that I’m in the same boat you are in, and sometimes I’m amazed how similar our ideas are. I totally agree with your comment about GWB, AIPAC and his Neocons group and the way they are using religion for their own benefits of spreading hatred and wars in the world and separating us according to our religions, sects and beliefs. But to be frank, what Majed wrote doesn’t sound as clear as what you wrote. In short: Better ‘clear’ than sorry. Right? I think you misunderstood me completely. I did not say christians and zionist, I said Christians backed by zionists this is clearly group of christians who are prozionist, in no way I meant all christians, but there are small group of christians who are pro zionists,like Jerry Falwell and Robertson. they are influenced by zionists.I was not grouping Christians with zionists . Sincerely, I’m honored to know a teacher like you. An interesting commentary that outlines “the cost” to the US of its continuing policies towards the nations of the Middle East. A tad long but worth a read. Bin Laden also warns the US there will be more attacks if it continues to support Israel. . . .
There’s no evidence that the Israel/Palestine conflict has ever genuinely been a primary concern for bin Laden or Al Qaeda generally. But it always ends up being a central feature of Al Qaeda’s propaganda; before the 9/11 attacks, bin Laden cited U.S. support for Israel as one of the three major grievances causing Al Qaeda to target Americans. And now it’s the principal reason cited in his most recent message for attacks on the U.S. The reason for this is obvious: though U.S. policy towards Israel may not motivate bin Laden himself — and Al Qaeda would hardly cease to exist if the Israeli/Palestinian conflict were resolved — it most certainly motivates large numbers of people who perpetrate attacks (including suicide attacks) out of allegiance to Al Qaeda or who otherwise lend critical support to that group. The suffering in Gaza is as intense as anywhere on the globe. Israel’s conduct, and America’s attitude toward that conduct, are an important lens through which Muslims see the United States. So time and again you tend to hear things like this about people who wind up working with al-Qaeda . . . This reality makes a lot of American Jews uncomfortable to the point where they try to insist on denying that Israel has anything to do with anyone’s motives for doing anything, but that’s absurd. A ton of people have died in the past ten years of Israeli-Arab fighting and the vast majority of them have been Arabs, and the American approach to these issues has conveyed the impression that America cares more about Israeli life than about Arab life. That’s good for al-Qaeda recruiting and bad for American efforts to secure cooperation. The connection between our conduct in the Middle East and the motivations for anti-American Terrorism receives far too little attention in general, and — for reasons Yglesias explains — the role played by our steadfast support for Israel receives less attention still. It goes without saying that the mere fact that Islamic radicals object to a certain policy (and that policy thus fuels anti-U.S. Terrorism) is not, by itself, a reason to discontinue that policy, but it’s certainly a cost that ought to be seriously weighed in deciding whether that policy is wise. Glenn Greenwald writes for Salon. Had you asked me this question 10-15 years ago, I would have answered that I would prefer the more direct “populist” form for democracy as in Israel, with one house, whose members directly represent small electoral districts where representatives will reflect in their deliberation the daily interest of their electorates. However, as I start my fifth decade, I get more rational, and see the benefit of having a more rational upper house, whose members represent larger groups of electorates and have longer terms, which shield them from the day-to-day politics and allow them to focus more on strategic visions. A two house body is more rational if one is to learn from the Israeli experience. It is likely that if and when Syria have a fully open political parties system, there will be many political parties. Some will be transient, and others will last long and have a much wider popular appeal. But the political life will likely be volatile, with coalitions forming in quarter and mid-term and leading to rapid change of government and to crippling the ability of parties to act on their electoral agenda to maintain these fragile coalitions. This is also important as in many cases, coalitions formed in the lower house can be contradictory in terms of social, economic and foreign policy platforms, or may simply be gained by adding members representing tribal affiliations, whose main aim is merely to establish influence of their tribes and will be willing to sell their votes without any fundamental platform motivating their votes. A dangerous recipe indeed as populism has always been. An upper house represents longer terms, and more fundamental agreements and may in fact be shielded from such coalition. I believe an 8 years term in the upper house, with two terms maximum, would be ideal with half of the members changing every four years. A 4 year terms for the lower house, with the possibility of maximum of 3 terms is a reasonable plan for the lower house. Off course the argument against term limits is valid, which stipulated that legislative leadership can only form over years of service (Ted Kennedy example). Similarly, having a dominant party receiving a very wide margin of votes in a single house system, may lead to many excesses and radical changes that may be costly and haphazard. An upper house can act as a moderating deliberative body. The two houses will have equal power in terms of establishing hearings, initiating legislation, and questioning executive bodies. But appointments to judicial posts, confirmation of ministers, and key executive officers would be prerogative of the more collegial upper house. Legislations must be approved and negotiated between the two houses, which in the end may lengthen the process, but I am always for more deliberations when and issue is to affect the entire nation. The one thing though that I would not want is a two party system such as we have here in the US. It would be devastating to real progress with a single or dual house system. No single or two parties should have the right to rig the political atmosphere and to prevent the rise of other alternatives as our democrats and republicans have been doing for generations. I want much more diversity and I do not want the establishment of political aristocracy that we have here in the two party system. I hate it to the core of my intellectual being. As you have always argued; all politics are local. What is really important for Syria is to have powerful city councils, elected mayors, and requirements for hearings and provisions for local ballots and initiatives. It is at that level where democracy is most direct. I still believe in presidential system, but with more powerful, directly elected prime minister. A direct parliamentary system such as in Israel confuses the separation between executive and legislative powers. I am not sure how can we maintain the separation and continue to have powerful elected prime minister. This is a constitutional theory issue and it is far beyond my pay grade. Even as a volunteer commentator. But the one thing I know, lists should not be adopted as I believe in one man one vote. Lists allow people to vote for multiple candidates and result in muddying the direct relationship between electorate and elected. You already have the democracy machine in Syria, clean it up and use it instead of keeping it rust in the garage or come up with something brand new that we don’t know how to use. Finally, I ‘THANK YOU’ for making me ‘weakening the nation spirit’! Why isn’t anybody from inside Syria commenting on this board? With all due respect expats have already voted with their legs against Syria. I may be wrong, but how many expats such as Norman, Ehsani, Alex and OTW have sent their children back to Syria or recommend they should live there? So, it would be interesting to hear a point of view from the people who actually live there permanently. Also, why doesn’t anybody who has attempted to return to Syria and returned comment? It is just very strange that this is a leading Syrian blog and not actual Syrian bothers to comment on it. What gives? Thanks for your response. So we both agree on the the two houses, may differ on the prime minister, and agree that sometimes gridlock is a moderating factor. I too like fixed size districts for the lower house, and regional equalizing district (may be counties) for the senate to correct the imbalance between large and small towns and counties. Points of agreement > points of no agreement. Not in your wildest dreams, Never against Syria, not if our lives depend on it. We are in search of better lives, but never against our home country. You will not find Chalabis on these pages. We may vote against a system, against a person, but never against Syria. Who told you that nobody from inside Syria comment on here? SC is not even blocked in Syria and many Syrians read it, comments on it and even link stuff written on here into their own blogs and news websites, even the domestic news websites, but what you know? Many of the expats you read their comments on here go vist syria regularly and they always come back and write about their experience and what they saw there be it negative or positive, because we all care, but again, what you know? You are doing the very typical thing you do best as a westerner, you thinks that you know everything and that you need to tell us what we should do and what we shouldn’t do in our own house, you’ve been on here for less than couple weeks and you are preaching us already, but again and again what you know? And about your `expats have already voted with their legs against Syria` it`s obvious that you know nothing. Piece of advice, go check the site archive before you open your mouth next time, I hate for your comments to sound, well, you know.. I hope that I didn’t hurt your feeling, it wasn’t my intention, I was just preaching you because you know nothing, enjoy your stay on SC wink wink! Ok, you voted with your legs against the realities of what Syria is: its leadership, its freedoms, its society, its economy, its future. What else is a country but the sum of these things? There may be some Utopian Syria that you love. But if Syria was actually what you loved you would not have left it. So you did vote against Syria but not against the Utopian Syria. They are not the same. Syria can only be changed from within. Would you recommend your kids go and try do that? If not, why not? Which commenter in the last few weeks is a Syrian who lives in Syria? Perhaps I missed him/her and you can correct me. Is there a regular commenter who is a Syrian that lives in Syria? Under what name does he post? So did my British-, Australian-, newzealanders-, israeli-,Dutch-, Canadian-, French-, …… just add after the Hyphen -American compatriots who attended the swearing ceremony years back. This is not to mention others from these and other nationalities I met and worked with who became US citizens. So are all of these oppressed and left hell holes. Every emigrant case is a case on its own. One can occasionally generalize the cases of massive disaster, such as the destruction of a country by foreign power (Ala Iraq), famine (potato famine), or persecution such as the case during the holocaust or political refugees (including many Syrians). Most other cases in our era are personal cases such as mine. There is nothing Utopian in Syria, but as a Human being, I am attached, and I am loyal to the safety and progress of my Syrian fellows. I guess you do not know the feeling. Things have to be exceptional for you to love a country. You know nothing about me and what I am doing to change Syria. So do not tell me what to do. I find that condescending and arrogant. I did not vote with my legs against realities in Syria or anywhere else. I simply made a choice to live where I had the opportunity to continue doing what I loved to do. Nothing more nothing less. But that exactly is the point. You voted with your legs against Syria because it didn’t give you the opportunity to continue doing what you loved to do. That is a reality of Syria that you voted against. You are right, I do not know what you are doing to change Syria. Can you elaborate on that? What do you view as the most constructive way of bringing change to Syria? Just asking, I love your questions and I think you heard one point of view but there are different ones. I think most of the expats on this site who survived the test of time do not represent all the colorful segments of the Syrians neither in the Diaspora nor in Syria, with all due respect to their valuable opinions and contribution. Syrians in general are not homogenous national such as Lebanese of Saudi or Jordanian, they are more individualistic and have many opinions related to sects, religion, origin, language, locality, political affiliation, employment with government, they are as different as their geography. But most certainly the authoritarian regime in Syria created an atmosphere of fear that no two Syrians can trust each other and say their opinions openly. But your questions I think very legit, I think persons who did not show opposition to the leadership in the country have immune themselves but the other can not even comments unless they decided not to visit the country for good. I was surprised in the number of Syrians who can not go back or visit their ill parents or claim their inheritance in my area only. I was surprised with the follow up from the authority for anyone who visits the country, heard too many stories. You would be surprise with the number of immigrants in the last 30 years, there is equal number inside and outside the country. Authority in Syria have one secrete service for each 153 person that include the expat. I was really surprised ten years ago when they made a station here in our town in the US to participate in the election (selection) of president (Say Yes or No for one candidate), many fanatic government supporters showed their identity; however participation was not even 1%. If you read this guy who immigrated to Australia and who after too many years in Diaspora can not say NO even to himself expect in his dark room which caused him to die from his fear when he did, you would understand exactly the amount of fear in this population. My apology from the guys who I did not share their view, I have different opinion do not attack me for that please. Sir, do not expect to see any comments from inside the country which attack or criticize the leadership or the regime, he will end up in jail, didn’t you heard the son of Haitham Elmaleh on this post, it is a totalitarian regime of upper notch, what you talking about. Haitham Elmaleh is the one who voiced his opinion to opposition channel and he is now in prison. You did not get my point because you did not want to get it. People from all over the world migrate to the US. Does that mean they all voted against their countries of origin. This is absurd. Why does a Syrian immigrant have to be a vote against Syria while an Israeli, French, British, or Indian immigrant is not a vote against their respective country of origin. Think about it and you see the racism and stereotype that it entails. My vote is for the US. And it could be simply out of selfish and comfort seeking human nature, or simply out of ambitions, but that does not mean it is against Syria. The world is not black and white and If you can not understand this simple fact, there is no point in arguing it with you any more. It is condescending to require that every post by a Syrian be a political manifesto or a declaration of opposition or a call for change. People may have interest in social issues, in encouraging art or literature in Syria or elsewhere, in appreciating the vibrant art scene, or in facilitating better understanding and demonstrating the humanity of all of us. Insisting that the only reason we immigrate is because Syria failed us denies us the right to personal ambitions and desires that you allow others. Again, if you can not see the point, there would be no point arguing it with you. OTW, for the factor of voting with their feet factor, Syria is 103 from 261 countries in the world, it comes after Saudi Arabia and after Libya but before a lot of other countries Arabs of else, way ahead of Egypt. Even this factor it is in eye of the beholder of how he sees the world and how his ambition and dreams. I think it is hard to interpret direct conclusions from the schedule, it still would require voting for finding out the inner feelings of the mass leaving their countries. That is why I said there are more one point of view. You know by now that I am not one who denies that many Syrians are in forced exile. But I hope you also know that I fully reject any attempts to cast us in one dimensional view. In your comment points to that superbly well. In essence, I agree that there are more than one points of view and this is exactly what I was driving at. The only one who was insisting on a single motivation for emigration was Just Asking. Both you and I highlighted the presence of multiple reasons that are consistent with the complexity and diversity of the Syrian society and for that matter, with any other society.